Remember this? Did it inspire you to make your own, knowing no matter how it turned out it could never be as bad as that one. Perhaps you yearn to build your own home? Why not give it a trial run in relatively cheap gingerbread dough first? Would you choose a modern house, a Cape Cod Cottage or Bungalow style perhaps? 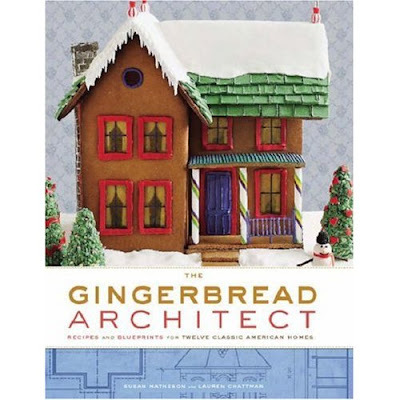 There are 12 designs to make your Gingerbread House more personal in The Gingerbread Architect by Susan Matheson & Lauren Chattman, and maybe inspire your home renovations, too. Have fun. We made gingerbread cities each Christmas when I was growing up! Of course, we "cheated" and used graham crackers for the siding and roof... fond memories. I've never tried the "real" stuff! I have never made a gingerbread house. I think maybe because I have it in my mind it might attract bugs if left out. I should try one year.